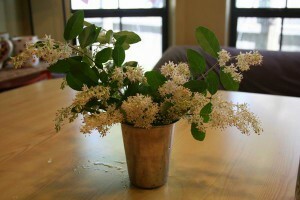 One of my favorite things in the spring is cutting a sprig of this or that and bringing some beauty indoors. I wrote a post recently (and might actually be brave enough to publish it soon) about getting overwhelmed at the chaos that is my yard, but choosing to focus instead on the beauty that is already there. It really inspires me to keep my tables cleaned when I have a gorgeous flower to put in the middle of it. It doesn’t take much. A few branches of some blooming thing: wildflowers, a flowering tree or bush, or one amazing rose. Here are some pictures from today. Everything’s in bloom, it seems. 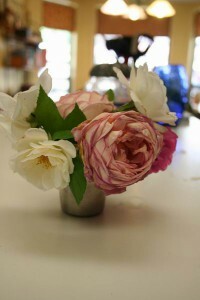 White roses and pink Abraham Darby rose. I am told this is Privet. Two weeks ago I thought it was a weed. This week I see it has tiny honey-scented blossoms and apparently, is a butterfly magnet. I’m not sure how I’ve missed this the last nine years I’ve lived in this house. 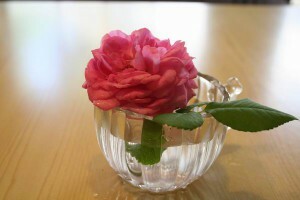 One gorgeous rose in one beautiful glass (my grandmother’s juice glass). It doesn’t take much to brighten up a room. Today we’re not doing school (other than a spelling page, listening to Little Town on the Prairie CD, and doing math worksheets), and I’m enjoying getting everything in order again after being out of town for a family camp over the weekend. And even though my toddler is potty training and things are a bit crazy with messes in the bathroom, we can still have a joyful kitchen and dining room with these friendly flowers smiling at us when we come in the room. They make us all happy. Here are the flowers that grow in our yard during the spring with very little involvement from me. This is the order in which they bloom. Bulbs (Daffodils, Tulips)- March – we planted one fall about five years ago. 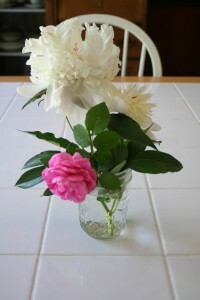 Roses/Peonies – April/May/June usually. I am in love with roses. I planted eight bushes three years ago (my birthday and Mother’s Day presents). They’re not thriving like I want, but they are working their best at it. At least one bush is blooming for most of April and May. But, in almost any yard, I’d bet there is something blooming and lovely, if you look hard enough. Wildflowers in a tiny vase are delightful. Send your kids out with their safety scissors and they can probably find something. What lovely things are growing in your yard? What do you enjoy in a vase? How do you bring God’s beauty into your home? This entry was posted in Uncategorized and tagged home, life with little ones, outside time by Charity Hawkins. Bookmark the permalink.